Posted by Gerald Lombardo on Tuesday, December 11th, 2018 at 9:22am. There’s a lot going on in Wellington over the holidays this year. Here are a few events you might enjoy. The Lakeside Family Fun Day is set to happen on Saturday, Dec. 15 on Lake Wellington, located behind the Wellington Community Center (12150 W. Forest Hill Blvd.). The event will feature a variety of free activities for the entire family to enjoy between the hours of 9 a.m. and 1 p.m., including kayaking, paddle boarding, a bounce house, a rock wall, glitter tattoos, lawn games, fishing, Plaster Time Crafts and more. Try goat yoga between 9 a.m. and noon and take photos with Santa between 10 a.m. and noon. 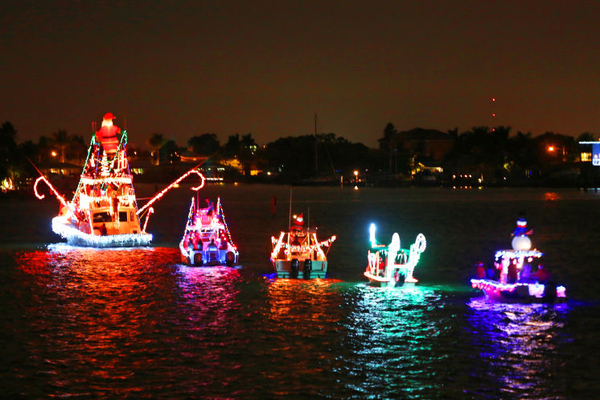 At Wellington’s Holiday Boat Parade, you can watch as local residents and boating enthusiasts light up Lake Wellington during Wellington’s annual Holiday Boat Parade. Visible from behind the Wellington Community Center (12150 W. Forest Hill Blvd. ), boats will launch from the Meadowland Cove boat launch at 6:20 p.m. and are expected to pass behind the Wellington Community Center around 6:25 p.m. Approximately 30 festive, decorated boats are expected to cruise in the parade. Motown Magic is a holiday spectacular you won’t soon forget. The event is set for Saturday, Dec. 15 at the Wellington Amphitheater (12100 W. Forest Hill Blvd). Food trucks will be available and a number of children’s characters will also be on hand for photo opportunities, including Santa Claus. The seventh annual Wellington Holiday Run 5K returns to Village Park (11700 Pierson Road) on Sunday, Dec. 16. The race begins at 7 a.m., and participants are encouraged to bring an unwrapped toy to be donated to families in the Wellington community as part of the annual Hometown Holiday Toy Drive.